Nationally known endurance sports coach and yoga instructor Sage Rountree has published the first book of yoga routines for athletes. The Athlete's Pocket Guide to Yoga: 50 Routines for Flexibility, Balance, and Focus offers runners, triathletes, and cyclists a convenient way to gain the benefits of yoga. When endurance athletes attend yoga classes, they bring tight muscles and even tighter schedules. At the height of the season, athletes often disappear from the yoga studio, yet it is then that yoga can be most beneficial. The Athlete's Pocket Guide to Yoga makes it easy for athletes to continue reaping the benefits of yoga all year. The Athlete's Pocket Guide to Yoga offers 50 simple yoga routines athletes can use every day. The book includes quick warm-ups and cool-downs, 20-minute flexibility routines to relieve muscle tightness, longer strength sessions for the off-season and base periods, focus exercises to sharpen mental toughness, and restorative routines to speed recovery. 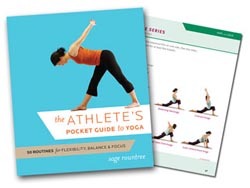 Even without any yoga experience, readers will find The Athlete's Pocket Guide to Yoga simple to use. Each page presents full color photos of athletes demonstrating the poses in a routine. Rountree groups routines by their goals so that readers can quickly address common problem areas like a tight lower back or hamstrings. The Athlete's Pocket Guide to Yoga is spiral bound so that it lies flat, making it easy to refer to the photographs while practicing. Careful consideration of the athlete's needs has earned Sage Rountree a committed following, and her newest book delivers a practical approach to yoga that will make good athletes better. Available late June in bookstores; bike, tri, and running shops; and online. Sage Rountree is a registered yoga teacher and holds coaching certifications from USA Triathlon, USA Cycling, and the Road Runners Club of America. Her popular yoga classes draw all levels of athletes, from recreational walkers to Olympic runners and Ironman triathletes. She is a contributor to Runner's World and Yoga Journal and has published articles in Running Times, Inside Triathlon, and Endurance magazines. Rountree has taught at Kripalu and offers yoga workshops for endurance athletes and coaches around the country. To try out an example yoga routine for athletes, please visit sagerountree.com. VeloPress is an endurance sports and fitness publisher focused on cycling, triathlon, and running. We publish books on training, history, gear, workouts, nutrition, yoga, and the culture and personalities of our sports. VeloPress is a unit of Competitor Group, Inc. which publishes Triathlete, VeloNews, Inside Triathlon, and Competitor magazines and which produces the Rock 'N' Roll marathon and half-marathon series and the Muddy Buddy adventure race series.